: Board Collector: Local Knowledge, indeed! 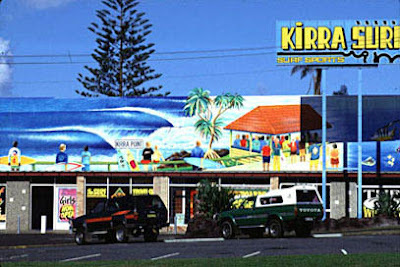 In the late 70's and 80's Kirra Surf on the Gold Coast Highway was the epicenter of high performance queensland surfing. The store was an exciting place to visit and home to the likes of Glen Rawlings, Jason Buttonshaw and Shane Powell. As well as a respectable stable of contemporary surfboards and hardware the store also housed a quite wonderful vintage surfboard collection. It was a true joy to visit the store and peruse the collection, sun burnt and surfed out from a Christmas cyclone swell and have a honey, soy, banana smoothie and veggie burger from the Healthy Bee next door. I picked up this cute Local Knowledge 5'10" double fly,channel bottom, swallow tail twin fin when they sold off their collection and got rid of the Healthy Bee to make way for acres of discount bins full of bad china made surf fashions. Kirra Surf has now become Australia's leading example of everything that is wrong with vacuous mass market surf culture, out of touch with its roots and chasing the tacky tourist dollar. Thankfully the lower gold coast and surrounding hinterland is breeding a new generation of committed and innovative surfers, shapers, musicians and film makers, who like me, skin crawls at the smell of these giant discount surf wastelands. sweet toyotas in the lot too...you just dont see that kinda style in day to day things anymore.